OptiLiner®: Bi-Directional Banded Liner System: What Is It? The OptiLiner® Bi-Directional Banded Liner System provides maximum thermal performance in pre-engineered metal buildings using NAIMA 202-96 Owens Corning fiberglass. In addition to excellent thermal performance, this system offers outstanding acoustics, a finished appearance and a brighter interior. 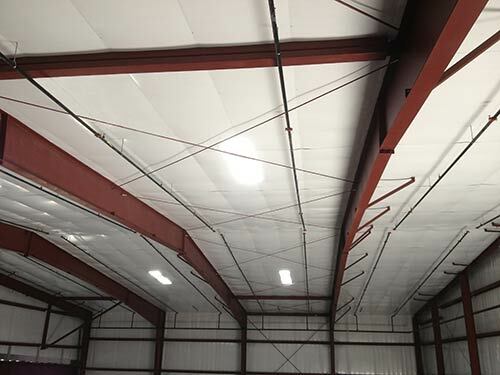 When installed in strict compliance with the official Owens Corning installation instructions, the OptiLiner® Bi-Directional System meets the requirements of OSHA Standard 29 CFR 1926.754(e)(3)(i) covers for roof and floor openings. The Bi-Directional System features a series of 1-inch galvanized steel straps that run parallel and perpendicular to the purlins (i.e. bi-directional). The banding supports either a white, black or gray fabric that serves as the low permeance vapor retarder. Fabric sections are custom fit for each bay to ensure a swift installation and a clean interior finished appearance. Any deviation from the official Owens Corning Bi-Directional System installation instructions or substitution of any original components will nullify compliance with the OSHA standard. Other means of fall protection such as perimeter safety, or guide lines, must be used at all times during the installation of the support strapping and prior to the completed placement of the support fabric, and when roofing while using this system. The use of OptiLiner® Banded Liner System is only part of the overall site safety plan for the construction site.